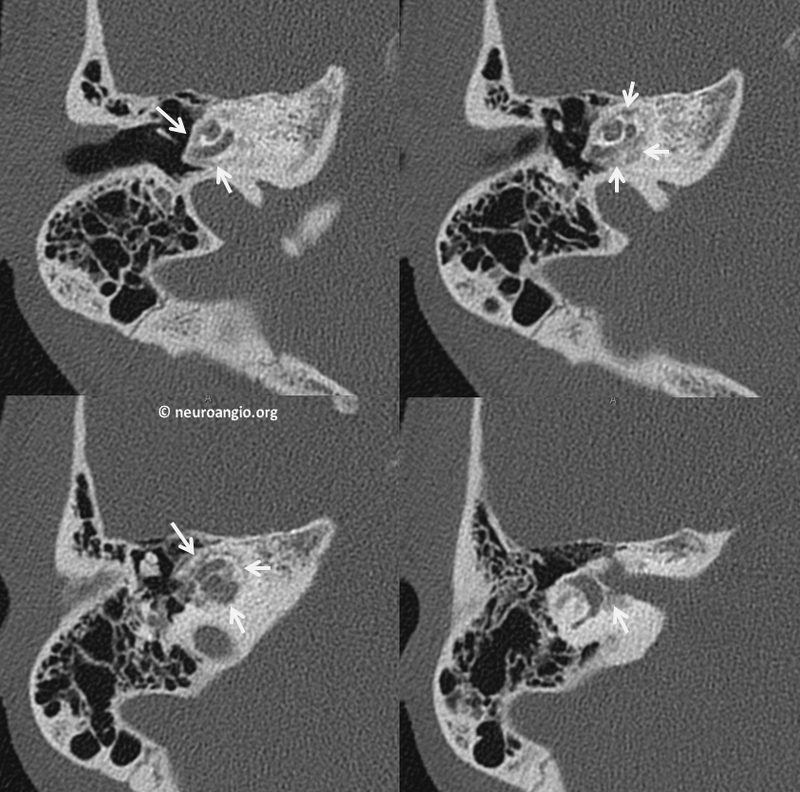 Otospongiosis (also known as Otosclerosis) is a rare condition where the normally super-dense bone around the cochlear (it is normally the densest bone in the body) becomes “spongiotic” or soft. The condition used to be called “otosclerosis” because in some stages of the disease the bone appeared “sclerotic” on x-ray imaging. It is however a misleading term because sclerotic implies more dense, whereas in fact the bone becomes less dense. So, the modern term is otospongiosis. Conductive nature of hearing loss leads to decreased ear sensitivity to external sounds and increased sensitivity to normal internal sounds, which include flow in the nearby carotid artery and jugular bulb. Beethoven, for example, who most likely had otospongiosis, would put a stick between the cover of a piano and his forehead to get the vibration of sound to transmit to his skull, and could hear it somewhat this way. 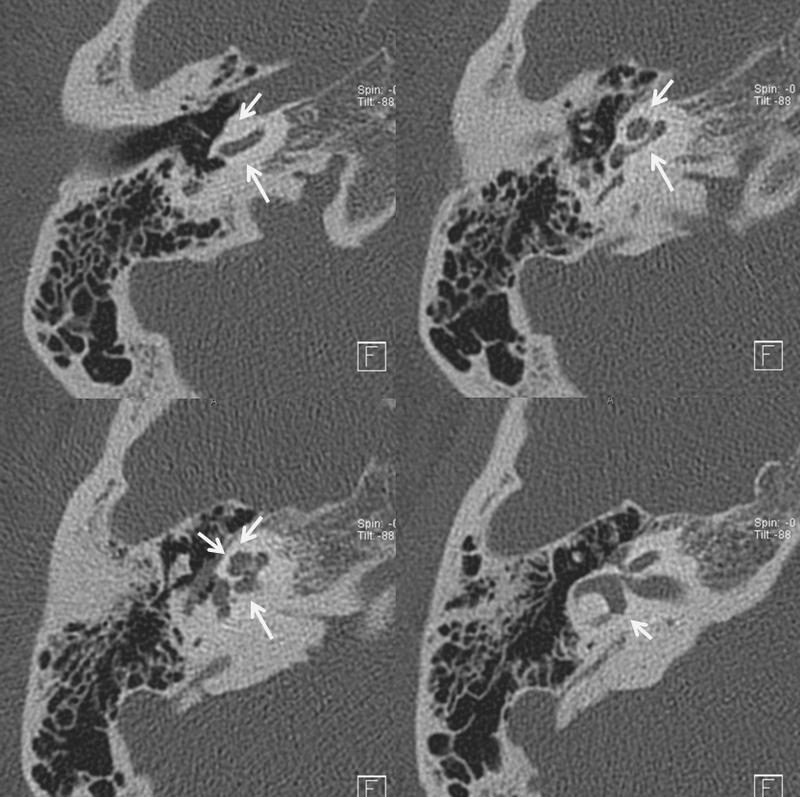 Otospongiotic bone is actually somewhat hypervascular and perhaps pulsatile tinnitus is due to actual sound of increased regional blood flow. Certainly this mechanism is responsible for PT in patients with glomus tympanicum and glomus jugulare tumors. However, otospongiosis is not a tumor and is nowhere near as vascualr as glomus. The bottom line is that we don’t know why a minority of people with otospongiosis have pulsatile tinnitus anymore than we know why some people with other forms of hearing loss have pulsatile tinnitus. I think reason (1) is still possible. Treatment is surgical. Sometimes, ossicular chain reconstruction works. Sometimes, its bad enough to require cochlear implant. Most patients with tinnitus due to hearing loss (pulsatile or not) report improvement after cochlear implant. It is however a very major step and must be discussed with a cochlear implant specialist.